RefrigiWear Comfort Ratings are guidelines that help communicate the level of warmth a person can expect from our products under normal activity levels. To assign a temperature rating, RefrigiWear takes into account key elements of the garment's construction. Taken together, these elements help create the "Insulating Power" a garment has to keep you warm. You must remember that Comfort Ratings are only guidelines and not a guarantee. It’s important to note that every person has a unique circulation and metabolism that impacts warmth and comfort in colder conditions. Please take your physical characteristics and planned activities level into account when considering the proper garment for cold environments. You can learn more from our Comfort Rating Guide. Outer Shell - The "shell" is the outermost layer of a garment and your first line of protection from wind, rain or snow. The outer shell can be made from a variety of materials, such as nylon, micro-fleece, or cotton, with other materials like elastane or stretch-woven polyester integrated into the weave. RefrigiWear measures the amount of material used per linear yard to help us estimate the insulating properties of an outer shell. For example, 10 ounces of nylon per linear yard will insulate more than 5 ounces. However, it may take 16 ounces of micro fleece to equal the same amount of protection as 10 ounces of nylon. Insulation - The insulation package of a garment works in conjunction with the outer shell to create more insulating power. 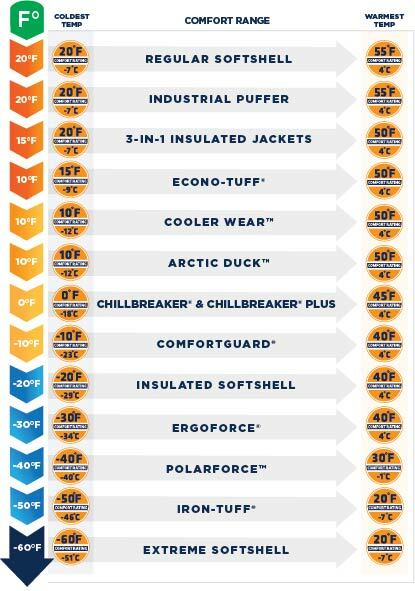 Similar to the outer shell, RefrigiWear measures the amount of insulation used per linear yard to create more or less insulation in a garment. It's important to take both elements into account because a jacket with a 16 ounce micro fleece outer shell and 16 ounces of insulation will provide much more warmth than a jacket with the same outer shell but no insulation. The variance between the two in this example could be a 60-degree swing in Comfort Rating. Lining - The lining of a garment contributes to the overall insulating power of a jacket through both thickness and the material used. Linings usually do not vary in thickness to the same degree as outer shells and insulation, but they may have features like reflective materials that optimize body heat by reflecting it inwards to enhance warmth. An ounce of thickness to the liner, however, does make a difference when adding to the insulating power of a garment. "I work in temperatures ranging from 0 to -10 degrees Fahrenheit . I am neither hot or cold natured, but I am in constant motion during the day due to my job. For me, a comfort rating of 10 degrees Fahrenheit was plenty since I tended to stay active. Anything warmer would have probably made me sweat too much instead of just remaining toasty during the day."